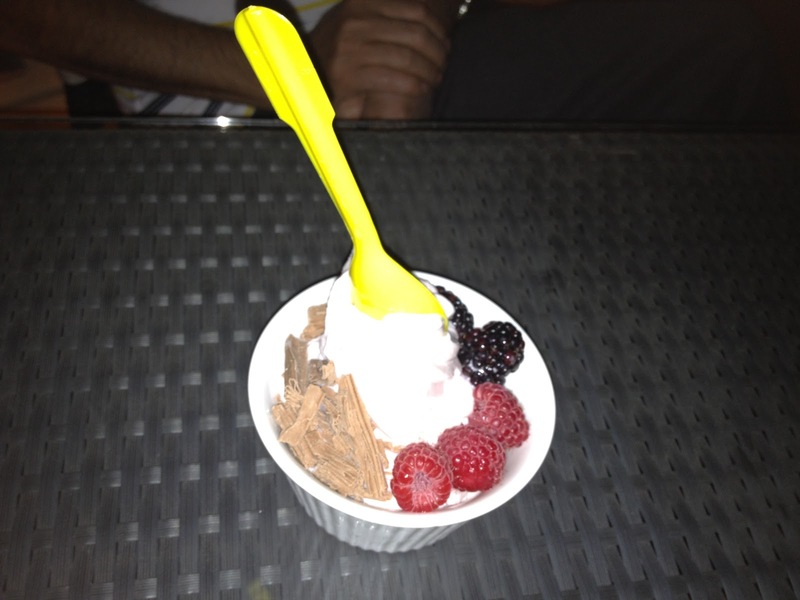 The fro-you was right consistency, and not too sweet, the fresh fruit and chocolate added an interesting addition to texture and flavor. You are free to choose your own toppings, the number of toppings depends on the size of the fro-yo, the smallest size has 4 toppings to go with it. There are nuts, chocolates, and my favourite fresh berries and fruit to choose from. It is rare to find fresh raspberries or even blueberries, or black berries here. I ordered a blueberry flavoured bubble tea, and my Mum ordered a pineapple flavoured bubble tea. We were later informed that they’d run out of pineapple. So we replaced it with kiwi flavoured bubble tea which was thankfully available. We chose to sit outside, as there was a wonderful breeze blowing, and the Jeddah Marina looked particularly serene from the terrace. The décor inside is white with a splash of neon colours and interactive tabletops. Seems like a tech savy teenager’s dream. The bubble tea arrived mine was garnished with a blueberry and Mum’s with slice of kiwi respectively. Bubble teas are of Far East Asian origin and can be chosen from a choice of black or green tea and additional fruit flavours. 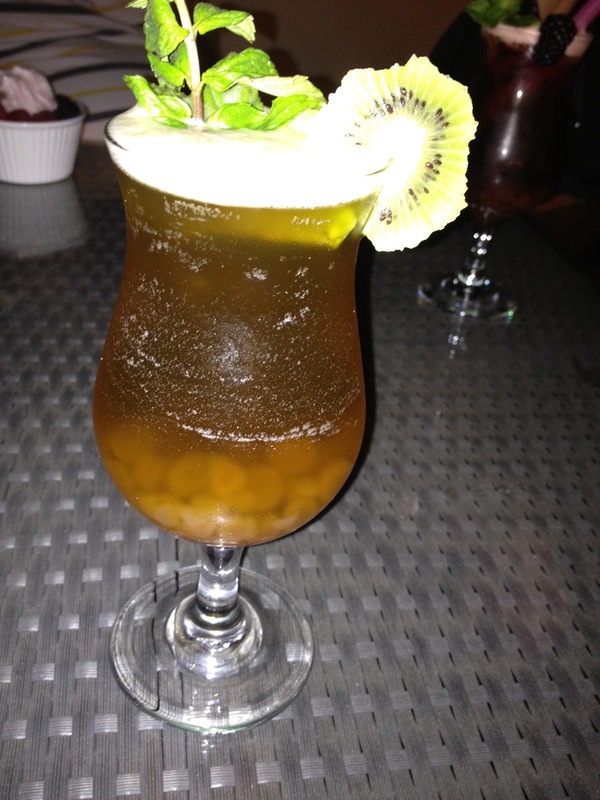 It is a type of ice tea and gets the term bubble from the tapioca pearl balls that are at the bottom of the drink, and which provide a chewy contrast to the sweetness and texture of the drink. 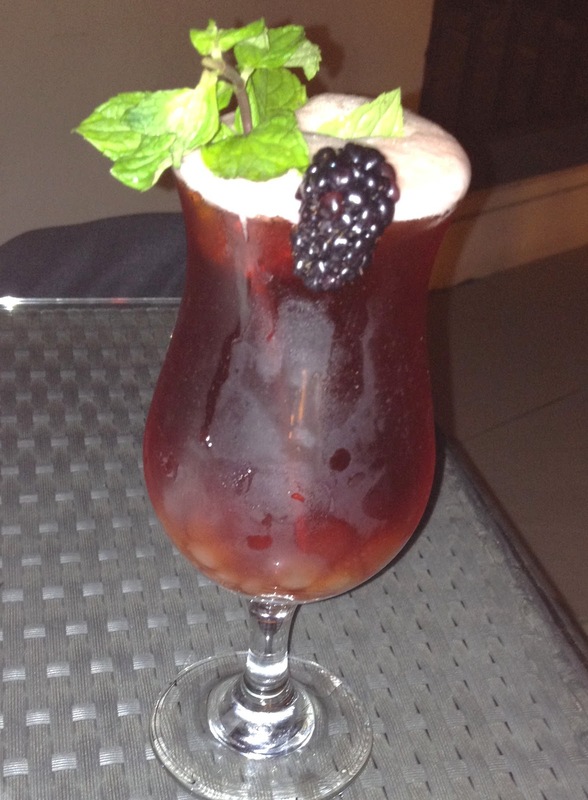 The drink was served accompanied by an oversized straw to enable the tapioca pearl balls to fit in your straw. The tapioca balls are soft and unexpectedly squishy and chewy. The tea was just the right sweetness and had a great fresh tangy flavor. I suggest that everyone should challenge their taste buds and try Yogette’s bubble tea at least once, as it is a new experience when it comes to drinks in Jeddah, but you may want to wait until their soft opening is over, in order to be able to enjoy the full variety of flavours. Update: They have their grand opening on 1st of March 2012, don’t miss it. Become fan of my Facebook page so you don’t miss out new posts. Here yogurt desert/ice cream trend is growing here too. But I still like original yogurt with sugar on it .